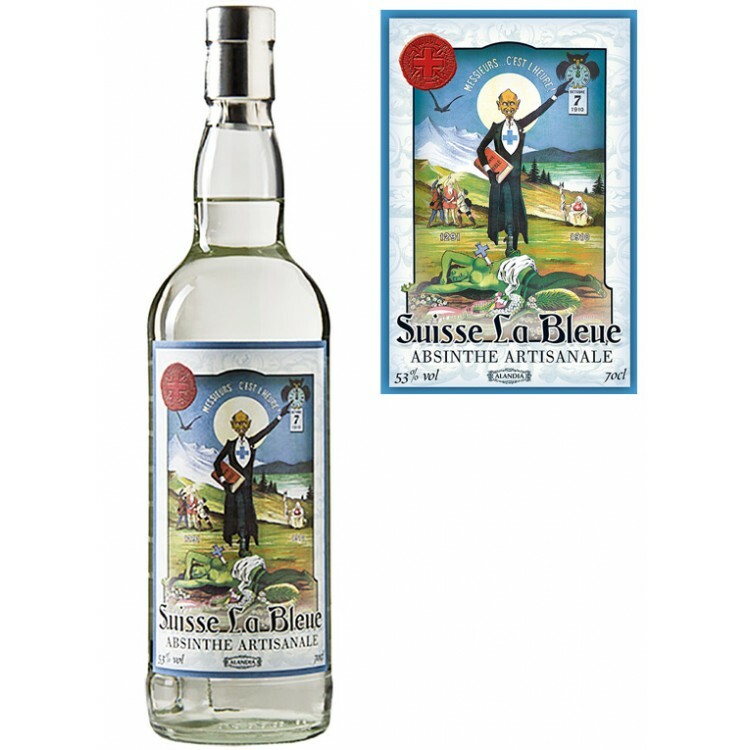 Suisse La Bleue Absinthe is a must try Absinthe for every true Absintheur. We love it so much, that we can almost guarantee, that you will love it as well. The name of this Absinthe refers to the slightly blueish louched color when you add water to the spirit. Other than that, this Absinthe is pure and clear as a diamant. 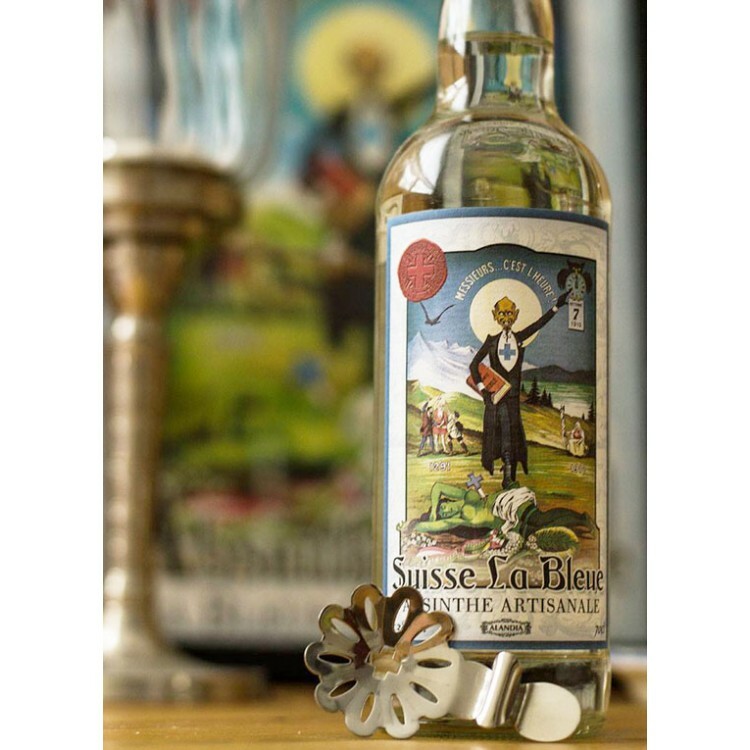 Suisse La Bleue Absinthe is a must try Absinthe for every true Absintheur. We love it so much, that we can almost guarantee, that you will love it as well. The name of this Absinthe refers to the slightly blueish louched color when you add water to the spirit. Other than that, this Absinthe is pure and clear as a diamant. In Switzerland, close to the city Bern and its magnificient mountain scenery, Suisse La Bleue is produced. The distillation takes place on a copper still, using traditional artisan methods. As the coloration step is skipped, the taste of Suisse La Bleue is extremely smooth. Sipping this Absinthe is a sensory experience, the scent of honey and flowers, and the complexity of the first sip introduces you into a fascinating world of taste. Definitely an experience you will never forget. INFO:Switzerland is often considered as the birthplace of Absinthe. In the 19th century, wormwood for the big Absinthe distilleries was cultivated in the Swiss valley Val-de-Travers in the Jura mountains. The humid climate guaranteed best quality. Right across the border, in the French city Pontarlier, many Absinthe companies, for example Pernod, had their headquarters. 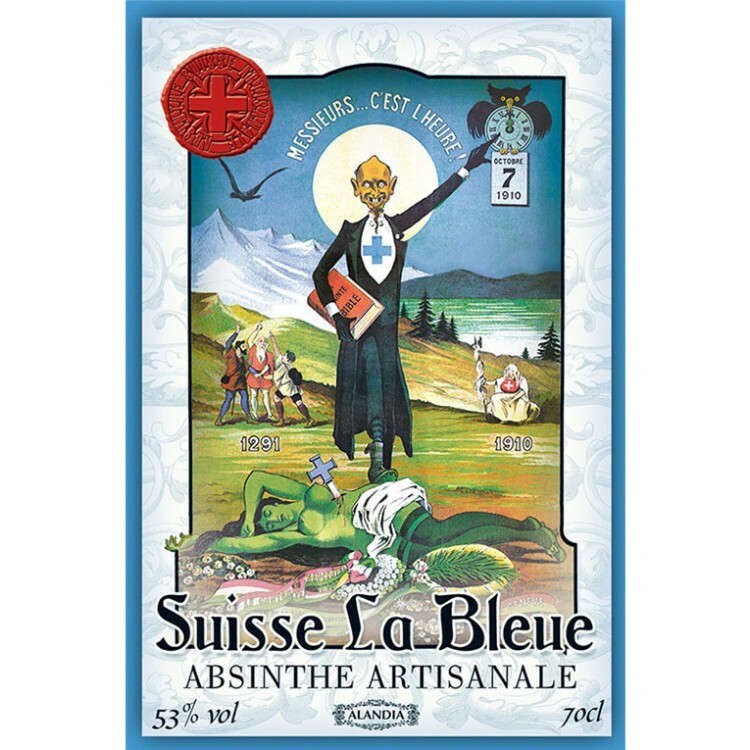 Why is there a freaky monk on the label of Absinthe Suisse La Bleue? In Switzerland Absinthe prohibition took place in the year 1910. 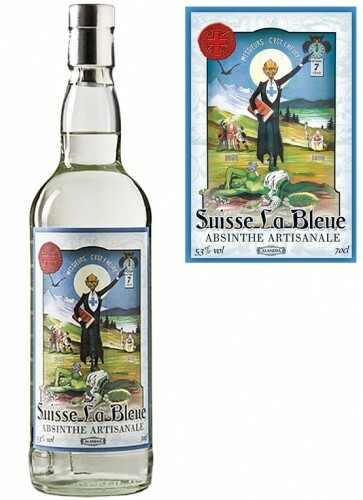 The label of Absinthe Suisse La Bleue shows the original Absinthe prohibition poster. The date and picture on the left side symbolizes the founding of Switzerland, on the right side you see rotten landscape, symbolizing the downturn of the country blamed on the Green Fairy. In the middle you see the anti-alcohol monk, which has defeated the Green Fairy. Actually this poster was an ironic reaction to Absinthe prohibition. The Swiss always loved Absinthe and although Absinthe production was prohibited for 100 years you could always find clandestine Absinthes throughout the country. In clear color, to camouflage the real content of the bottle. AT this price point I can't find another absinthe I like more. This one becomes almost creamy once it has opened up in the water. Super smooth, so enjoyable. More and more I am digging the swiss bleue absinthes. Wow!! This was my first experience with absinthe, but it won't be my last. Great experience!! I will be ordering again....just don't know if I should get another bottle of Suisse La Bleue or try something different. Will probably do both and order 2 bottles next time!! Thank you Alandia!!! I'm a big fan of La Bleues and have had many different brands. I have to say that this is one of my all time favorites. Nice louche and wonderful floral aromas and flavor. This is the second best Absinthe that I have ever had. The color, smell, taste, etc. all excellent. One doesn\'t even need sugar for this one. The only Absinthe that beats this on is the Swiss Green. Unfortunately, because of the stupid laws where I live, this cannot be imported because it is 72% alcohol which exceeds the limit by 2%. Oh well, I guess the politicians know what\'s best for us don\'t they.